Integrated Science, Technology, Education, and Math (“STEM”) education is becoming increasingly important in today’s technology-driven world. Teachers are tasked with trying to entice kids towards STEM and kids are told often how important mathematics and the sciences are. We believe, however, that a more hands-on approach to learning technology — such as a School 3D Printer Maker Challenge — not only helps kids gain a deeper understanding of the subjects, but also a greater appreciation of how important technology is in their daily lives. The relevance of tech and its accessibility are key for kids. Growing up, parents and teachers told us that math was important, but often did not explain why it is important. It took a lot more to make us see how math, making things, and playing with science actually can be fun! At Airwolf 3D, we play with technology every day. We learn every day. We invent every day. This playful culture of creativity, exploration, and invention is what we’d really like to teach and spread around the world. This is just the kind of fun challenge for teachers and kids that really can inspire. By turning ideas into designs and then transforming those designs into physical objects, kids can learn how to invent. By developing a product, kids learn how manufacturing and design cycles work and may be inspired to invent independently. This is why we’re a proud supporter of the ocMaker Challenge where kids get to use Airwolf 3D printers to invent! What is a School 3D Printer Maker Challenge? A School 3D Printer Maker Challenge is an integrated STEM project that incorporates elements of art and design. The students must design and manufacture a product. 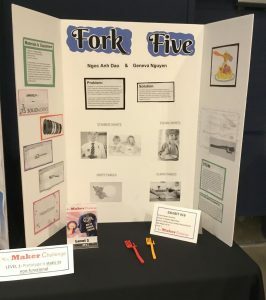 For the ocMaker Challenge, the event was organized and promoted by the Orange County Department of Education and CTEoc (Career Technical Education of Orange County) and supported by Vital Link. Airwolf 3D proudly serves as the event’s main sponsor and has the honor of providing the prize money for the ocMaker Challenges. La Quinta High School’s exhibit demonstrating their innovative STEM challenge solution. There are four different levels of entries. Level 1 is a creative approach to create a static or non-functional prototype, such as a 3D print of their idea. At Level 2, the part has to do something. It must be dynamic and have some functionality. For example, it might turn on or have hinged parts that move. Level 3 starts to kick it up a notch: The part needs to include some form of “intelligent” technology. That means that the prototype responds automatically and selectively to a particular condition or situation. Level 4 requires all of the elements of level 3, plus the prototype displayed at the final exhibit must also include some form of tooling or fabrication process. Examples of fabrication processes include bending metal or cutting wood. Participants’ exhibitions consist of a presentation, video, and prototype. First, they have to create some form of physical prototype or model. Then they also must prepare a presentation board. Finally, students also have to produce a promotional or demo video. 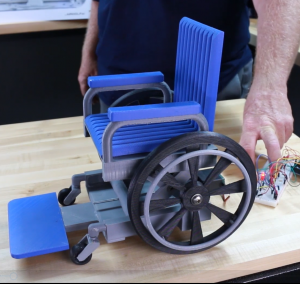 Elevating Wheelchair made by a group of ocMaker Challenge 2016 winners from Anaheim High School. There are not too many rules and constraints. The product must be created specifically for the maker challenge. Another rule is that the students need to be able to clearly identify the STEM concepts used in the process. As students move through the design process, they also learn how to articulate to the judges the STEM concepts used. This exercise facilitates deeper learning and develops the ability to recognize STEM concepts in future problem-solving scenarios, empowering students to go further in the future! Airwolf 3D is no stranger to educational experiences and hackathons. In addition to serving as the main sponsor of all three annual ocMaker Challenges, Airwolf 3D recently completed a similar event at Warner Bros. in which participants were working adults, not young students. Furthermore, they only had 32 hours to complete their project. Read more about the Warner Bros. Hackathon. Comprehensive Maker Challenge Manual that includes sample competition rules and regulations, and judging rubrics. Free access to online training for students that includes instructional videos, graded quizzes for students, and real-time emailed grade results for teachers. For more information, please contact Airwolf 3D at (949) 478-2933 or email us at info@airwolf3d.com. Find out how to host your own 3D Printer Maker Challenge and receive a FREE 3D Printing Curriculum! Sign up to receive a free download of our highly popular 3D Printing Curriculum which includes complete STEM lesson plans that introduce students to 3D printing. We will never share or sell your information. Click to download your Free 3D Printing Curriculum! 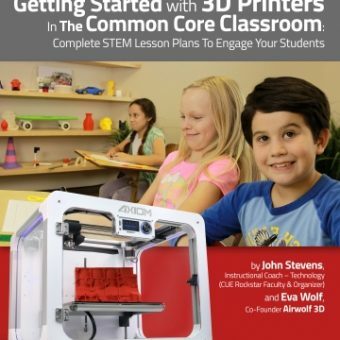 Airwolf 3D presents School 3D Printing classes in Irvine, CA!